Pokémon GO mania has taken over the world, and here we decode the gameplay for you based on our experience. Pokémon GO mania has taken over the world, even though technically it has only launched in US, Australia and New Zealand. But everyone is playing Pokémon GO thanks to switching App Stores on iOS, fake Apple IDs, APK files on Androids and other tricks. A recent WSJ report says the game will launch in Asia and Europe in the next few days. Hopefully India won’t be left out of the list when the Asia release takes place. Official launch or not, Pokémon GO has taken over our lives. Here’s how you can play the game once you download it. Do note: On iOS, I won’t recommend using other app stores to get the game, because it doesn’t work so well. I finally got it via the official app store, and yes the game is a lot of fun to play. First up: You need to sign in to get access to the game. The sign in is via Google Account, and yes Niantic Labs is facing some heat over asking for full account access and raising privacy red flags. But let’s be clear: we all just really want to play this game. Once you sign in, you will then be able to choose the looks of your character before the Pokémon journey begins. Pokémon GO has to be played outside, as I found out. 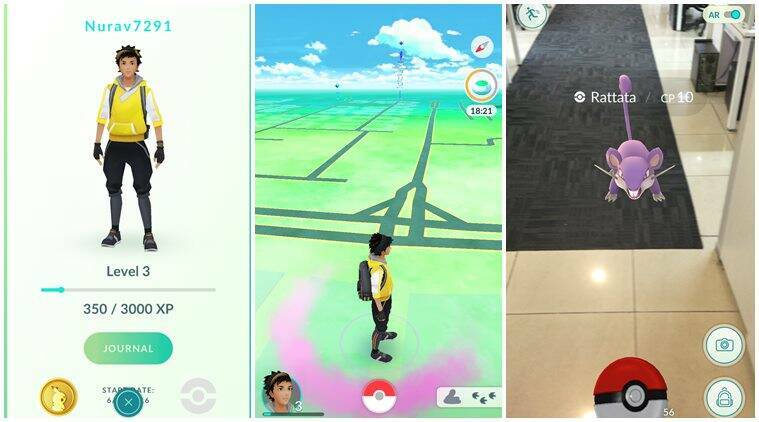 Get ready to walk around a lot and you’ll be able to find different Pokémons as they pop up on your map, and your phone vibrates. When you get close enough to a Pokémon, you can click on it to engage them. The camera will turn on and you will be able to see them in front of you. The augmented reality experience is actually pretty cool. If a Pokémon has foot marks below it, this means they are close by. But you need to move around a little to find them. How to catch a Pokémon: Just like in the series, Pokéball is your friend. Click and hold on the Pokéball as it appears on your screen, and wait for a green ring to appear around the Pokémon. The ring reduces in size before becoming large again. Now comes the tricky bit: You need to aim your Pokéball to hit the Pokémon through this ring to catch it. Take Note: Some pokémons will be able to flick away the pokéball, so throw properly. 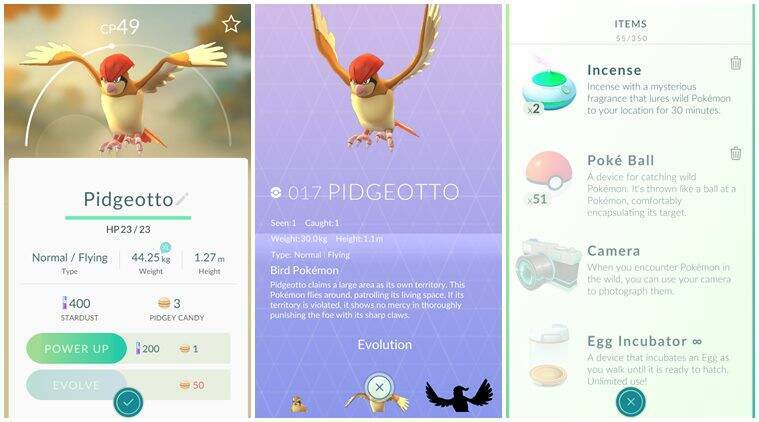 As I found out, catching one Pidgeot was not so easy. Get creative: Throwing a curve ball is one way to catch these monsters. Swerve the pokéball by holding on to it, and then move it in circles before throwing it. This move will also get you bonus throw points. Sadly I didn’t do so well with this move. 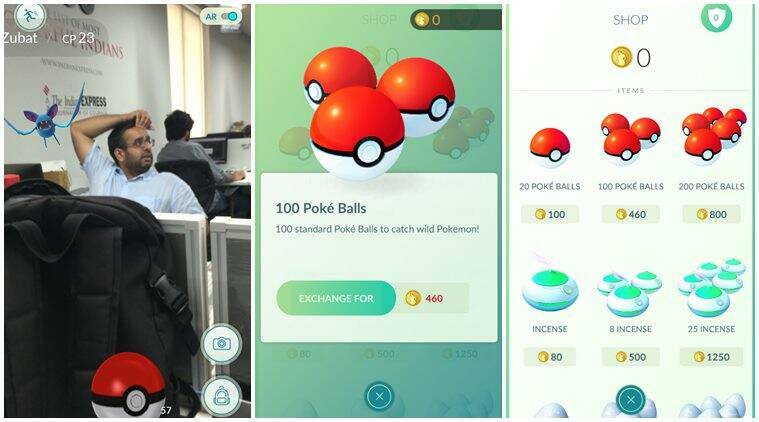 Trading: If you have a Pokémon that you do not want, you can send it to the “Professor” who will give you Pokémon candy in return. The catch: you won’t get that Pokémon back. The game also marks the area on the map where you catch a Pokémon. Improving your levels: As you catch Pokémons, your experience will rise and you will climb through the levels. You get the most experience for catching a new Pokémon. I’m still on level three, since I can’t keep walking all over Noida during work to hunt for these creatures. Perhaps I’ll do better at home. Favourite: A caught Pokémon can be marked as favourite by selecting a gold star on them. Catching them will also give you resources like “Stardust”, which can be used to power up your Pokémon. You can find the same with hatching eggs and owning gyms. To evolve a Pokémon (like say Charmander into Charizard), you will require candy. Take note that Pokémons will disappear from the map eventually if you do not catch them. 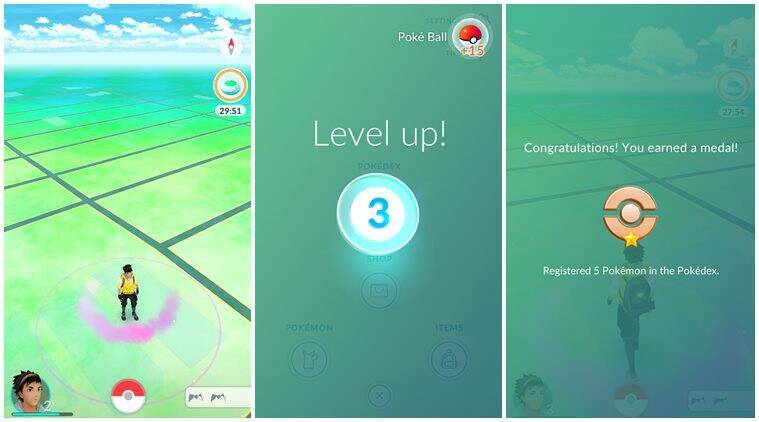 As you evolve in the game, you get additional Pokeballs or you can go to ‘PokeStops’ to get some. Most of the ‘PokeStops’ are too far from my office. A wild “Zubat” appears on the boss’ head, but thankfully I managed to catch it. The Pokedex shows the number of Pokémons you have seen, and the number of Pokémons caught. Clicking on a Pokémon in the Pokedex will tell you more about the Pokémon – its weight, height, type and evolution. All Pokémons have a “CP” number over them – CP being Combat Power. It is in this menu, where you can give your dear Pokémon a nickname. The items in your bag include – Pokéballs, Incense, Egg incubator. With incense, you can lure Pokémons thanks to the fragrance for 30 minutes. Some items are available when you start a game, but need to be bought with the in-app purchase option as you consume them. One needs Pokécoins for that. “Nearby” table shows Pokémons in your immediate vicinity. When you visit Pokéstops, you will find pokéballs and eggs. If you get an egg, you will need to put it in an incubator and walk a certain amount of distance to hatch the egg and get a new Pokémon. You can get a rare Pokémon in these eggs. Also a good way to boost up your daily step count. Zoom in on the map, you’ll see Gyms or Pokéstops, which are closest to your location. Gyms are where you can test your skills with Pokémon battles. Level 5 is where you need to get to fight or train at gyms. If you plan to play the game a lot, you can choose to disable your AR camera in order to conserve battery. Trading Pokémon isn’t an option in the game yet, but it will be a fun feature to have eventually.